During its history the Australian Army has fought in a number of major wars, including: Second Boer War (1899–1902), First World War (1914–18), the Second World War (1939–45), Korean War (1950–53), Malayan Emergency (1950–60), Indonesia-Malaysia Confrontation (1962–66), Vietnam War (1962–73), and more recently in Afghanistan (2001 – present) and Iraq (2003–09). Since 1947 the Australian Army has also been involved in many peacekeeping operations, usually under the auspices of the United Nations, however the non-United Nations sponsored Multinational Force and Observers in the Sinai is a notable exception. Australia's largest peacekeeping deployment began in 1999 in East Timor, while other ongoing operations include peacekeeping on Bougainville, in the Sinai, and in the Solomon Islands. Humanitarian relief after 2004 Indian Ocean earthquake in Aceh Province, Indonesia, Operation Sumatra Assist, ended on 24 March 2005. The 1st Division comprises a deployable headquarters, while 2nd Division under the command of Forces Command is the main home-defence formation, containing Army Reserve units. 2nd Division's headquarters only performs administrative functions. The Australian Army has not deployed a divisional-sized formation since 1945 and does not expect to do so in the future. 1st Division carries out high-level training activities and deploys to command large-scale ground operations. It has few combat units permanently assigned to it, although it does currently command the 2nd Battalion, Royal Australian Regiment as part of Australia's amphibious task group. Forces Command controls for administrative purposes all non-special-forces assets of the Australian Army. It is neither an operational nor a deployable command. 1 Brigade – Multi-role Combat Brigade based in Darwin and Adelaide. 3 Brigade – Multi-role Combat Brigade based in Townsville. 6 Brigade (CS&ISTAR) – Mixed brigade based in Sydney. 7 Brigade – Multi-role Combat Brigade based in Brisbane. 16 Aviation Brigade – Army Aviation brigade based in Enoggera, Brisbane. 17 Combat Service Support Brigade – Logistic brigade based in Sydney. 2nd Division administers the reserve forces from its headquarters located in Sydney. 4 Brigade – based in Victoria. 5 Brigade – based in New South Wales. 9 Brigade – based in South Australia and Tasmania. 11 Brigade – based in Queensland. 13 Brigade – based in Western Australia. Army Aviation Training Centre at Oakey, QLD. Special Operations Command comprises a command formation of equal status to the other commands in the ADF. It includes all of Army's special forces assets. Under a restructuring program known as Plan Beersheba announced in late 2011, the 1st, 3rd and 7th Brigades will be re-formed as combined-arms multi-role manoeuvre brigades with the 2nd Battalion, Royal Australian Regiment (part of the 3rd Brigade) forming the core of a future amphibious force. The force will be known as the Amphibious Ready Element and will be embarked on the Navy's new Canberra-class amphibious assault ships. All colours of the Army were on parade for the centenary of the Army, 10 March 2001. Infantry, and some other combat units of the Australian Army carry flags called the Queen's Colour and the Regimental Colour, known as "the Colours". Armoured units carry Standards and Guidons – flags smaller than Colours and traditionally carried by Cavalry, Lancer, Light Horse and Mounted Infantry units. The 1st Armoured Regiment is the only unit in the Australian Army to carry a Standard, in the tradition of heavy armoured units. Artillery units' guns are considered to be their Colours, and on parade are provided with the same respect. Non-combat units (combat service support corps) do not have Colours, as Colours are battle flags and so are only available to combat units. As a substitute, many have Standards or Banners. Units awarded battle honours have them emblazoned on their Colours, Standards and Guidons. They are a link to the unit's past and a memorial to the fallen. Artillery do not have Battle Honours – their single Honour is "Ubique" which means "Everywhere" – although they can receive Honour Titles. The Army is the guardian of the National Flag and as such, unlike the Royal Australian Air Force, does not have a flag or Colours. The Army, instead, has a banner, known as the Army Banner. To commemorate the centenary of the Army, the Governor General Sir William Deane, presented the Army with a new Banner at a parade in front of the Australian War Memorial on 10 March 2001. The Banner was presented to the Regimental Sergeant Major of the Army (RSM-A), Warrant Officer Peter Rosemond. The Army Banner bears the Australian Coat of Arms on the obverse, with the dates "1901–2001" in gold in the upper hoist. The reverse bears the "rising sun" badge of the Australian Army, flanked by seven campaign honours on small gold-edged scrolls: South Africa, World War I, World War II, Korea, Malaya-Borneo, South Vietnam, and Peacekeeping. The banner is trimmed with gold fringe, has gold and crimson cords and tassels, and is mounted on a pike with the usual British royal crest finial. In the 2014–15 financial year the Army had an average strength of 43,667 personnel: 29,366 permanent (regular) and 14,301 active reservists (part-time). In addition, there are another 12,496 members of the Standby Reserve. The regular Army is targeted to expand to 30,464 (regular) and 15,250 (part-time) personnel by 2015–16. Personnel numbers have trended upwards since a peak in 2010–11 with an actual strength of 29,366 full-time personnel. Army Reserve numbers are 14,301, which does not include Standby Reserves. This gives the Army a combined strength of 43,667 active personnel for the year 2014–15. Field Marshal (FM) – OF-11. This rank is generally reserved for wartime and ceremonial purposes; there are no regular appointments to the rank. Sir Thomas Blamey is the only Australian-born officer promoted to the rank. Prince Philip, Duke of Edinburgh, is currently the only living holder of the rank of Field Marshal in the Australian Army. The Duke, however, does not have any active role in the Australian command structure. Artillery 112 L118/L119 105 mm Hamel Guns (In reserve), 36 M198 155 mm Howitzer (In reserve), 54 M777A2 155 mm Howitzer, 36 RBS-70 surface-to-air missile systems. Radar AN/TPQ-36 Firefinder radar, AMSTAR Ground Surveillance RADAR, AN/TPQ-48 Lightweight Counter Mortar Radar, GIRAFFE FOC, Portable Search and Target Acquisition Radar – Extended Range. 10 One CH-47D lost in Afghanistan on 30 May 2011. From an initial fleet of six; two additional CH-47Ds were ordered in December 2011 as attrition replacement and to boost heavy lift capabilities until the delivery of seven CH-47Fs, which will replace the CH-47Ds. All seven Chinooks were delivered in August 2015. The US State Department has approved the possible sale of three more CH-47F aircraft as of December 2015. The 2016 Defence White Paper confirmed the order of three CH-47F aircraft. Eurocopter Tiger Attack helicopter Tiger ARH 22 Delivery completed early July 2011. Achieved Final Operational Capability on 14 April 2016. Sikorsky S-70 Black Hawk Utility helicopter S-70A-9 34 Will be replaced by the MRH 90 by June 2018. 18 to be kept in operational service for special forces until the end of 2021 due to issues with MRH 90 with an additional 2 retained. The Army's operational headquarters, Forces Command, is located at Victoria Barracks in Sydney. The Australian Army's three regular brigades are based at Robertson Barracks near Darwin, Lavarack Barracks in Townsville and Gallipoli Barracks in Brisbane. The Deployable Joint Force Headquarters is also located at Gallipoli Barracks. Other important Army bases include the Army Aviation Centre near Oakey, Queensland, Holsworthy Barracks near Sydney, Lone Pine Barracks in Singleton, New South Wales and Woodside Barracks near Adelaide, South Australia. The SASR is based at Campbell Barracks Swanbourne, a suburb of Perth, Western Australia. Puckapunyal north of Melbourne houses the Australian Army's Combined Arms Training Centre, Land Warfare Development Centre, and three of the five principal Combat Arms schools. Further barracks include Steele Barracks in Sydney, Keswick Barracks in Adelaide, and Irwin Barracks at Karrakatta in Perth. Dozens of Australian Army Reserve depots are located across Australia. Since 1947, the Australian Army has published its own journal titled the Australian Army Journal. Covering a broad range of topics including essays, book reviews and editorials, with submissions from serving members as well as professional authors, the journal's stated goal is to provide "...the primary forum for Army's professional discourse... [and to facilitate]... debate within the Australian Army ...[and raise] ...the quality and intellectual rigor of that debate by adhering to a strict and demanding standard of quality". In 1976, the journal was placed on hiatus; however, publishing began again in 1999 and since then the journal has been published largely on a quarterly basis, with only minimal interruptions. A replacement for the Tiger ARH helicopter was identified in the 2016 Defence White Paper. The Army is set to retire the helicopter earlier than expected after encountering numerous issues with sustainment and serviceability rates. While the Tigers were initially supposed to get a $1–2 billion mid-life upgrade, a new type of helicopter—either manned, unmanned or a combination of both—is set to enter service from the mid 2020s. A new deployable short-range ground-based air defence missile system is slated to replace the RBS-70 MANPADS by the early 2020s. A new medium-range air defence system is also to be acquired in the late 2020s. The new system will help defend deployed airfields, command centres and other valuable assets from enemy air attack. The Army has lacked a medium-range air defence system capability since the Rapier's retirement in 2005. Land-based anti-ship missiles were outlined as a new requirement in the 2016 Defence White Paper to defend deployed forces as well as offshore assets such as oil and natural gas platforms. The Australian Government committed to improving the systems that individual soldiers use. Items outlined in the DWP include "weapons and targeting equipment, digital communications systems, body armour and self protection equipment (including for chemical, biological and radiological threats), and night fighting equipment." 1,100 Hawkei protected mobility vehicles are currently being procured at a cost of around $1.3 billion. The Bushmaster PMV is to be replaced beginning in 2025 by a new platform. Land 400 replacement program is set to replace the existing 257 ASLAVs and 700 M113 APCs with Boxers. To complement current artillery, a new class of long-range rocket artillery is to be introduced in the mid 2020s. The new system, yet to be named, will be able to provide fire support for troops at three hundred kilometres. A riverine patrol capability is to be re-established in 2022. The capability will be established around a fleet of small, lightly armed patrol vessels to allow access to a range of different environments. The Army has outlined a need for enhanced intelligence, surveillance and reconnaissance capability. With this, they plan to acquire a fleet of armed, medium-range unmanned aerial vehicles along with regular capability updates. They will provide enhanced firepower and ISR as well as a counter-terrorism ability overseas. They will also assist in humanitarian and relief missions. ^ a b "Defence Annual Report 2013–14, Volume One: Performance, Governance and Accountability" (PDF). Department of Defence. Retrieved 3 April 2015. ^ "Defence Act (1903) – SECT 9 Command of Defence Force and arms of Defence Force". Australasian Legal Information Institute. Retrieved 19 October 2010. ^ Grey 2008, pp. 88 & 147. ^ a b Odgers 1988, p. 5. ^ Grey 2008, pp. 200–201. ^ Grey 2008, pp. 284–285. ^ "Australian War Memorial Official History of Peacekeeping, Humanitarian and Post-Cold War Operations". Retrieved 4 April 2009. ^ Horner 2001, p. 195. ^ "Forces Command". Australian Army. Archived from the original on 7 September 2013. Retrieved 11 September 2013. ^ Jobson 2009, p. 53. ^ Jobson 2009, pp. 55–56. ^ "National Flags, Military Flags, & Queens and Regimental Colours". Digger History. Archived from the original on 5 April 2007. Retrieved 3 April 2007. ^ Jobson 2009, p. 58. ^ "Army Flags (Australia)". Flags of the World. Archived from the original on 3 April 2007. Retrieved 3 April 2007. ^ Defense Annual Report 2014–15: Volume One Performance, governance and accountability (PDF). Commonwealth of Australia. 2015. pp. 128–130. ^ Australian National Audit Office (2009). Army Reserve Forces (PDF). Audit Report No. 31 2008–09. Canberra: Australian National Audit Office. ISBN 0-642-81063-X. Archived from the original (PDF) on 15 May 2009. ^ Defence Portfolio Budget Statements 2014–15 (PDF). Department of Defence. 2015. p. 24. ^ Army, Australian. "M1 Abrams Tank – Australian Army". www.army.gov.au. Retrieved 1 February 2016. ^ "Army officially accepts new armoured vehicles". defenceconnect.com.au. Retrieved 21 April 2017. ^ "Contract Signed for Additional Bushmasters" (Press release). The Hon. Joel Fitzgibbon MP, Minister for Defence. 29 October 2008. Retrieved 29 October 2008. ^ "More vehicles on the way". Army News. Canberra: Australian Department of Defence. 26 May 2011. p. 16. ^ "Australian Army orders additional Bushmasters from Thales". Retrieved 2 November 2012. ^ "Army Technology". Defence Jobs. Retrieved 31 January 2011. ^ a b "World Air Forces 2016 report". flightglobal.com. Retrieved 10 December 2015. ^ "Three more CH-47F helicopters delivered ahead of schedule in FMS deal". Australian Aviation. 26 June 2016. Retrieved 1 August 2016. ^ "Australia set to acquire three more CH-47F Chinooks". Australian Aviation. Retrieved 2 January 2016. ^ 2016 Defence White Paper (PDF). Australia: Commonwealth of Australia. 2016. p. 20. ISBN 978-0-9941680-5-4. ^ "Minister for Defence – New training system for ADF helicopter crews". Media Release. Minister for Defence. 23 October 2014. Archived from the original on 25 August 2016. Retrieved 1 August 2016. ^ McMaugh, Dallas (9 April 2016). "Future ADF training helicopter arrives at HMAS Albatross". Royal Australian Navy. Retrieved 1 August 2016. ^ Beurich, Cpl Sebastian (28 July 2016). "A story of innovation and commitment" (PDF). Army: The Soldiers' Newspaper (1378 ed). Retrieved 31 July 2016. ^ Kerr, Julian (2 December 2015). "Australian Army to extend Black Hawk service lives for special forces use". Jane 's Defence Weekly (53.4). Retrieved 30 July 2016. ^ "S-70A-9 Black Hawk Weapons". Defence Materiel Organisation. Department of Defence. Retrieved 8 November 2014. ^ Ashby-Cliffe, Cpl Jane (12 November 2009). "Kiowas' final salute" (PDF). Army: The Soldiers' Newspaper (1225 ed). Retrieved 1 August 2016. ^ "Australian Army retires fleet of Bell 206B-1 Kiowa helicopters | Jane's 360". www.janes.com. ^ "Australian Army Journal". Publications. Australian Army. Retrieved 3 September 2015. ^ "Past editions: Australian Army Journal". Publications. Australian Army. Archived from the original on 12 March 2015. Retrieved 3 September 2015. ^ ""Troubled" Tiger set for early retirement, new light helicopter for Special Forces on the way". Australian Aviation. australianaviation.com.au. 26 February 2016. Retrieved 28 February 2016. ^ a b c d e f g h 2016 Defence White Paper. Australia: Commonwealth of Australia. 2016. pp. 94–98. ISBN 978-0-9941680-5-4. ^ "16 Air Defence Regiment History". Australian Air Defence Artillery Association. Australian Air Defence Artillery Association. Archived from the original on 26 February 2016. Retrieved 28 February 2016. ^ "White paper full of praise for Hawkei". Bendigo Advertiser. Bendigo Advertiser. 25 February 2016. Retrieved 28 February 2016. Horner, David (2001). Making the Australian Defence Force. Melbourne, Victoria: Oxford University Press. ISBN 0-19-554117-0. Odgers, George (1988). Army Australia: An Illustrated History. Frenchs Forest, New South Wales: Child & Associates. ISBN 0-86777-061-9. Australian Department of Defence (2009). Defence Annual Report 2008–09. Canberra, Australian Capital Territory: Defence Publishing Service. ISBN 978-0-642-29714-3. Grey, Jeffrey (2001). The Australian Army. South Melbourne, Victoria: Oxford University Press. ISBN 978-0-19554-114-4. Palazzo, Albert (2001). The Australian Army: A History of its Organisation 1901–2001. Melbourne, Victoria: Oxford University Press. ISBN 0195515072. Terrett, Leslie; Taubert, Stephen (2015). Preserving our Proud Heritage: The Customes and Traditions of the Australian Army. Newport, New South Wales: Big Sky Publishing. ISBN 9781925275544. 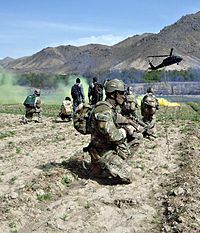 Wikimedia Commons has media related to Australian Army.